Speed Optimizer Pro is a system optimization program which you can encounter when installing some media player, adware program, fake update for your Internet browser, etc. There are many programs similar to Speed Optimizer Pro, some of which are categorized as potentially unwanted programs (PUP). Speed Optimizer Pro is also regarded as a PUP and can be removed from the computer by a powerful spyware and malware removal tool. In order to prevent similar programs and Internet-based computer infections, you should pay more attention to the installation process. Always pay close attention to the installation wizard and deselect check boxes related to the installation of additional programs. Speed Optimizer Pro is distributed alongside adware programs and other system optimization programs, which is why you should be extremely careful when dealing with bundled installers. 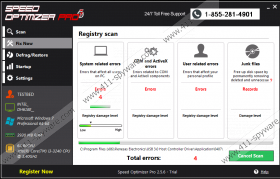 Speed Optimizer Pro launches when your Windows starts and starts a registry scan. You can turn off this process in the Settings section by deselecting the associated box. Speed Optimizer Pro identifies system errors, COM and ActiveX errors, unnecessary files, including Internet temporary files. Every scan is accompanied by a woman’s voice; more specifically, you are information about the end of the scan and encouraged to register the program so that you can have all the errors fixed. As regards the registration of the program, the full version can be purchased in two ways. You can use your Paypal account or a debit card to pay for the license. The price of the software program is $39.99 without any special offers or discounts. If you have a working knowledge of how to enhance the performance of the system and fix various errors, you may not need Speed Optimizer Pro on your computer. Some users find this program useless and want to remove it soon after trying it out several times. If you have already tried Speed Optimizer Pro but have no intention of registering it, you should remove it from the computer. As for the removal of Speed Optimizer Pro, you have two options. You can either uninstall it or implement SpyHunter, which will remove the unwanted program for you automatically. We advise you to choose the latter option because your computer needs protection against malware and spyware programs, which include Trojan horses, rogue anti-virus programs, ransomware infections, browser hijackers, and many other malicious programs. In case you want to remove Speed Optimizer Pro from the computer by yourself, use the following removal instructions, which will help you uninstall the unwanted program. After you have uninstalled Speed Optimizer Pro, implement a reputable scanner so that you can ascertain whether the computer contains files that have to be deleted. Uninstall Speed Optimizer Pro (published by ShieldApps).